When I first met Nixon Skenderi, he was 14 months old and only 12 lbs. In his short life, this little champ was already a miracle. 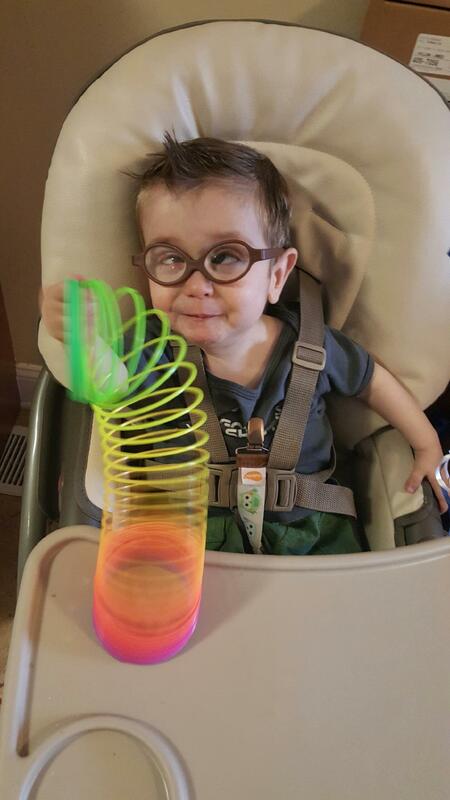 Diagnosed with a rare type of Gaucher’s Disease at 6 months, Nixon was given up to three years to live. His parents, who refused to accept the terrible prediction, sought out every possible expert for treatment—which led them to a specialist at the Children’s Hospital of Pittsburgh. After a week of testing there, the family packed up and relocated in hopes of saving Nixon’s life. Today, says Nixon’s mom, Kristin, he is the only child diagnosed with his type of Gaucher’s Disease whose life was saved by an umbilical cord stem cell transplant and chemotherapy. Nixon still has a long road of therapy ahead to help him thrive. When he first finished chemo, he was left with an aversion to liquids. Kristin’s been using one of my high fat/high calorie food blends to feed Nixon pureed solids through a g-tube. He’s even able to drink milk and water by spoon now. Kristin and I are in touch all the time, and I’m thrilled to see that Nixon is finally gaining weight. Like many social service providers in Illinois, I have been seeing early intervention clients, like Nixon, since June without receiving pay. For me, of course, it’s been stressful, but I can’t compare my financial burden to the challenges our state’s budget impasse has caused for the early intervention clients I serve. All of us are a bit more at ease since Illinois Comptroller Leslie Geissler Munger announced her office will begin making payments to providers soon. But overall, the past few months emphasized more than ever for me how crucial early intervention nutrition is for my youngest clients. And now, as our state officials review the Illinois budget, I worry about funding for nutrition services. Early Intervention provides government support for therapies for children up to age 3. Without the state’s assistance, therapies such as speech, occupational therapy, physical therapy and nutrition could cost families as much as $200 or more per session. Children who don’t get their needs met at this young age will usually experience increased problems in the future. The state’s Early Intervention program provided services to more than 20,000 children last year diagnosed with at least a 30 percent delay in at least one area, or who are at risk for delay, according to an article in The Chicago Tribune. While nutrition wasn’t always a part of the Early Intervention program, I can tell you countless reasons why it must be. Children with developmental delays or those who battle childhood illnesses must first address nutrition before conquering other therapies. A child who needs occupational therapy to learn to sit up or walk needs strength from a nutritional diet. And if this child has an aversion to food or has trouble swallowing—which is so often the case for these kids—nutrition therapy must be in place as well. 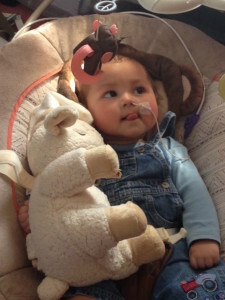 Isaiah depends on early intervention therapies, including nutrition. failure to thrive. His mom, Sarah, says Isaiah was vomiting 6-8 times a day and couldn’t gain weight because of it. I’ve worked with Sarah for nearly a year to try several different types of formulas and pureed food mixtures until finding a blend that works for Isaiah. I was also directly in touch with Isaiah’s doctors to discuss a treatment other than the NG tube that wasn’t working for him. Now, at 16 months and with a g-tube, he’s gaining weight and has the strength to focus on his other therapies. All of his therapy, says Sarah, is the only way that Isaiah will start school at age 3 able to sit up, speak and keep down food to the best of his ability. Let’s hope that our state takes a cue from little champions, like Nixon and Isaiah, to keep fighting for our most vulnerable citizens. Last week, the U.S. Department of Agriculture and the Environmental Protection Agency — along with many private-sector and food-bank partners — announced the first-ever national target for food waste. “[We’re] basically challenging the country to reduce food waste by 50 percent by the year 2030,” Agriculture Secretary Tom Vilsack told NPR. Vilack adds that 133 billion pounds of food is wasted each year–enough to fill Willis Tour. A lot of that waste comes from agriculture (no one wants to buy ugly fruit), manufacturers and restaurants. But, there’s plenty of waste going on in our own homes as well. 1. Boil or bake old fruit. 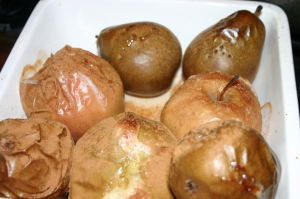 Browning apples, pears and even grapes become an incredible treat when you cook them. Add a bit of water and cinnamon to a pot or a baking pan and cook them until soft. Mash it up and enjoy it hot. I guarantee it will all be gone in minutes. These spent 45 minutes in the oven at 350 degrees. If you’re in a hurry, you can zap them in the microwave for 3-5 minutes. Be sure to pierce them with a fork first. 2. Use products after their sell by date. Most goods are still good well after the sell by date. Be careful with meat, but other than that, the date is merely a suggestion and doesn’t mean much. You can check if eggs are good by placing them in water. If they sink to the bottom and lay on their side, they’re good. And milk? Sour milk is actually buttermilk. Cook up some pancakes with them! 3. Put your old bread to use. Make breadcrumbs once, and you’ll be laughing at anyone who ever buys them. Give bread a whirl in a food processor, and you’ve got breadcrumbs. Store them in the freezer for at least a few months. 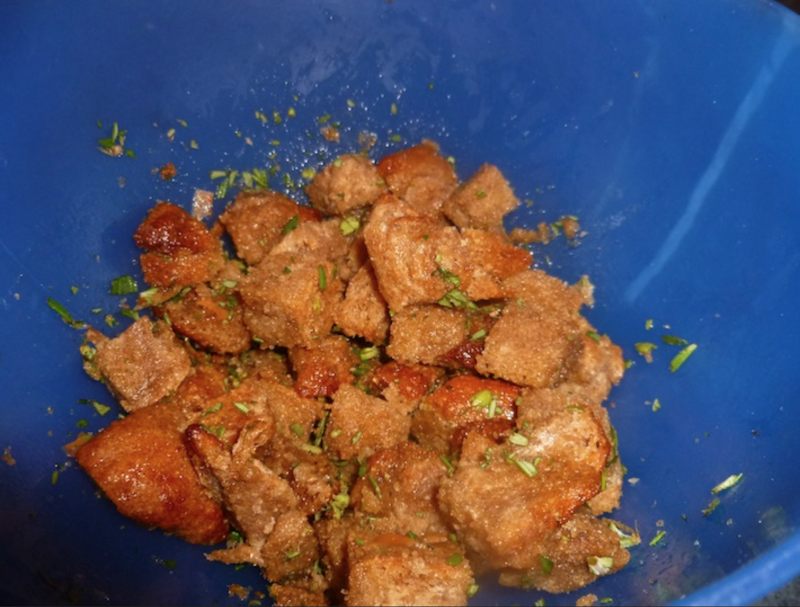 Or, dice old bread into squares, toss with spices and some oil and bake at 350 for 10 minutes. Hello, croutons. 4. Use your vegetable scrapes. All those ends of carrots, onions, cauliflower, broccoli and more? 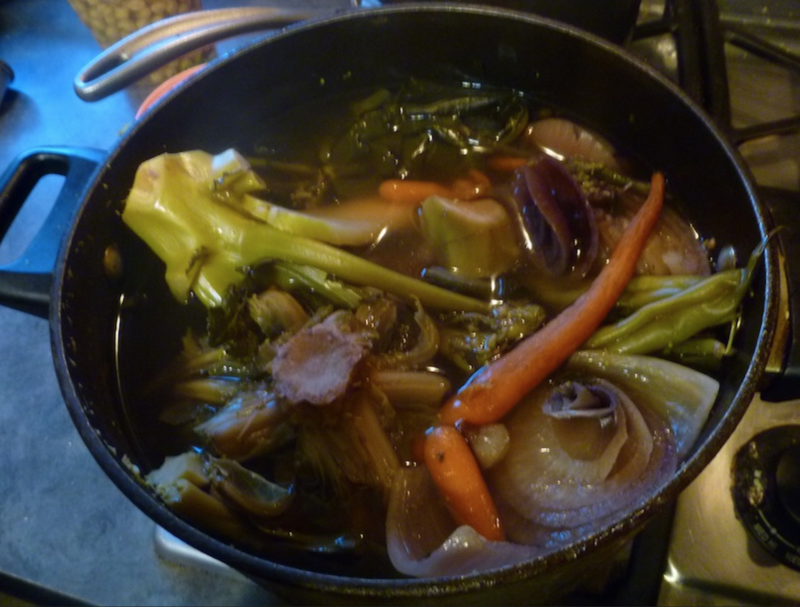 Those veggie scraps make incredible stock. Keep a gallon freezer bag in your freezer and add vegetable scraps every time you cook. When you’re ready to make soup, boil the veggies in water with salt for 20-30 minutes. Strain it, and add it to your soup instead of water. Did I mention this soup is free? For most of us who recall a favorite food from childhood, it brings us back to a favorite person, place or memory. But for my patients with irritable bowel syndrome (IBC), food is a pain—literally. These kids will try to enjoy an ice cream—or even a bowl of cereal—now only to pay later. So many foods can bring on stomach pain, indigestion or diarrhea that they and their parents are left to wonder what can they put in their mouths? Developed by researchers in Australia only about a decade ago, the FODMAPs diet is still somewhat underused among dietitians because it can seem so restrictive. The diet eliminates a number of foods, from dairy to gluten, for a period of about two weeks. Then, patients slowly reintroduce foods back into their diet in order to see what does or does not irritate their stomach. The idea is that some carbohydrates feed the “bad bacteria” in patients’ guts, causing pain and irritation. The goal is to identify those fermenting foods. Since encouraging some of my own patients to try the FODMAPs diet over the past four years, I have found the plan to be both effective and necessary. By eliminating so many foods at the start of the diet, we are able to get to the source of a patient’s stomach problem. By eliminating foods, we also eliminate the guesswork. The whole diet takes a few weeks and about three visits. And you know what? Most of my patients find that even the restrictive period of the diet is manageable, thanks to the meal plans I provide. Since the diet is food restrictive but not calorie restrictive, there is no reason a child on the FODMAPs diet should be hungry. The key is to finding healthy alternatives that will not irritate the stomach. And then, at the end of the treatment, patients leave knowing exactly what foods they can tolerate. I’ll be giving a talk to the North Suburban Dietetic Association at the Northwest Community Hospital in Arlington Heights on September 16, focusing on the FODMAPs diet.